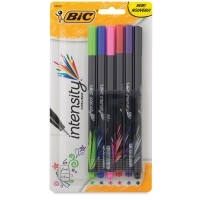 Perfect for writing, drafting, or even doodling, the Bic Intensity Fineliner Marker Pen provides bold, crisp strokes in a range of vibrant colors. 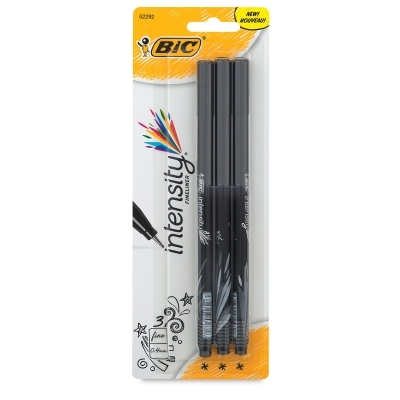 These pens hold waterbased ink that won’t bleed through most paper (results may vary depending on the paper type being used). Available in a variety of sets, they feature porous, fine (0.4 mm) points. 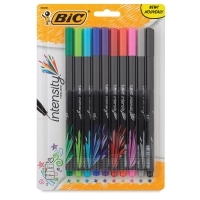 Assorted Colors, Set of 10 — This set includes one each of Black, Blue, Gray, Green, Light Green, Light Blue, Orange, Pink, Purple, and Red. 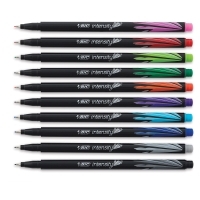 Assorted Colors, Set of 6 — This set includes one each of Black, Blue, Green, Pink, Purple, and Red. 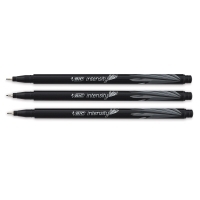 Black, Set of 3 — This set includes three Black pens. ® BIC is a registered trademark.® Intensity is a registered trademark.